I have been doing Software Architecture for 16 years and Enterprise Architecture for the past few. Along with architecture I usually find as part of each gig, if not the main focus of each gig, process implementation or at least process improvement is required. It is not easy keeping up the latest technologies, processes, architectural techniques, and enterprise architecture framework improvements. I am a firm believer that to be an architect, you must also be an experienced developer. I do not believe in the hands off architect role and wish the Ivory Tower Architects would stop claiming to be Architects. They are theorist not architects. Modeling, Governance, and documenting are part of the architect's job, but in order to produce valuable artifacts you need to be getting your hands dirty. I also run into a ton of Googler-Developers. Meaning they have no idea why they are using the code they are using, they just know someone else posted it so it must work. Google has been one of the biggest assets and one of the biggest downfalls for the development community. Proof of concepts are one of the most important parts of the architecture process, and Google has made it easy for developers and architects to shortcut the learning and thinking part of the process. Back in 1994 when I started my own business I decided I would at a minimum invest 10% of my income back into my education. Over the years that has gone into tons of books, MSDN licenses, other software, and of course equipment. Now more than ever an architect needs a lot of assets to keep up. I currently carry 5-6 books I am reading with me and 2 laptops to work every day. A shot of my home office is below. On the next page are the tools I am currently using to stay current. My hope is that it helps others heading into software development or software architecture understand what it takes to stay current. 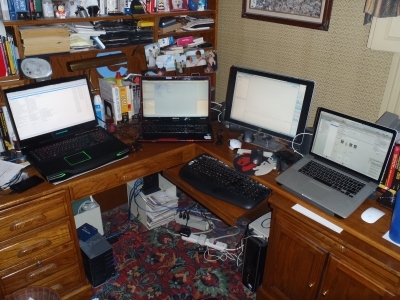 I have four laptops, a windows home server, and a desktop I use at home. The MacBook Pro has 16GB of RAM and a 512GB SSD hard drive. The Alienware has 32GB of RAM and a 750GB 7200RPM hard drive. The Toshiba has a 64GB SSD and a 500GB hard drive. On the MacBook I program in Xcode and I am running Windows 8 (which by the way is the best place to run it) in Parallels Desktop 8 for Mac . I use Visual Studio 2012 and SQL Server 2012 on Windows 8 instance. On the Alienware I use Visual Studio 2010 and 2012 with SQL Server 2012. I also have several virtuals built in both Windows Server 2003 and 2008 R2. I do not have any in Windows Server 2012 yet because the RTM kept bombing in VMware. I tried installing it 3 times with no luck. I also have an instance of Windows 8 set up in VMware, but rarely use it. I have an instances of SharePoint 2003, 2007, 2010, and 2013 I use to proof of concept. I am just finishing up a big 2007 to 2010 migration and without these environments it would not be happening. The Alienware allows me to run two virtuals at the same time with plenty of power left over. My mice are big time productivity savers. Besides the two shown here, I also own the Apple Magic Mouse. It is the best mouse made for the Mac and is by far the best mouse for Windows 8 on the Mac. The two shown here are awesome for programming, which is all I use them for. When people see my equipment they always ask which games I play. The last game I played was Link (The Legend of Zelda) in the late 1980s. I have both of these programmed to work with Visual Studio and they work great for building and running, stepping through code, and injecting snippets. I use coolers on all my machines when I am running them heavy. I started using them because my main laptop that I had 4 years ago would overheat to the point of shutting down. I use the NotePal U2 for my MacBook. What I like about it is it has 2 fans that can be repositioned and completely removed. I also use this cooler to provide additional protection for my MacBook Pro in my backpack. I put my MacBook Pro in a Thule MacBook Sleeve and then slide the Thule Sleeve into the NotePal U2 . Together they provide excellent protection. I use the ZM-NC2000 for my Alienware and Toshiba. I doubt the Alienware needs it because when its fan system kicks into to high gear it is like a jet engine starting up, but I use it anyway. Most of the time I do not need to use the fans on these. Just getting the laptops off the desk provides the cooling they need. I own several external hard drives. I use them for storage but I also use them to run virtuals off of them. I have a Western Digital WD Elements 1 TB USB 2.0 and a U32Shadow (on the right). It is a 1 TB USB 3.0. Virtuals run fine from the externals and the externals allow me to keep tons of them. I have virtuals with Windows 2000 and VB 6.0 development environments and every environment in-between up to Windows 8 and Visual Studio 2012 available. This is the first year since 2002 that I am not a MSDN subscriber. I still have one through my current job, but decided to give my personal one up. For years as a consultant I found value in having access to all the Microsoft tools and servers, but Microsoft has changed my opinion over the past two years. My attitude now is if a company wants me to develop in Visual Studio, they can provide the license from now on. Microsoft may change my mind in the future if when they get their act together, but right now they are nothing but aggravating to me. The way I look at it is Microsoft has to be doing enough to keep me making enough to afford a license, if they aren't, then I am just throwing my money away. I felt I had been burning $5000 a year for nothing over the past 2 years and the future they are offering I have no interested in. I will learn Microsoft technologies and use it to get a check, but the techie in me has lost all passion for Microsoft. All that being said, if you are a consultant in the world of Microsoft and you love what they are doing, your current firm should provide an MSDN as part of your contract. If they don't, I would say raise your rate so you can cover it yourself. If I ever get passionate about Microsoft technologies again and the place I am at does not give me an Ultimate license, I will purchase my own. That however won't be anytime soon. I use the MSDN subscription to set up environments to do proof of concepts and make use of the software that comes with it. I use Expression Studio 4 Ultimate, Team Foundation Server 2012, Visual Studio 2012 Ultimate, Office 2013, and Microsoft SQL Server 2012. You can check out your MSDN Subscription options here. Apple offers two real developer programs and a free Safari developer program. The Mac Developer Program allows developers to distribute their Mac apps on the Mac App Store, the iOS Developer Program allows developers to distribute their apps on the App Store and reach millions of iPad, iPhone, and iPod touch users, and the Safari Developer Program includes all the tools and resources for creating extensions that enhance and customize Safari. I currently only belong to the iOS Developer Program. I like being able to push my apps to my devices for testing and the iOS Developer Program allows me to provision devices to do so. Since Xcode 4 is free to download, that is the only advantage I get right now. If I want to push my applications out for approval and to the store I can also do that with the license. You can check out the developer programs at the links below. Below is some of the key software I use beyond what Apple and Microsoft provide. SPARX System's Enterprise Architect- Enterprise Architect 9.3 is a high performance modeling, visualization and design platform based on the UML 2.4.1 standard. Eclipse Process Framework (EPF) - The Eclipse Process Framework (EPF) aims at producing a customizable software process enginering framework, with exemplary process content and tools, supporting a broad variety of project types and development styles. Android Development Tools (ADT) is a plugin for the Eclipse IDE- Designed to give you a powerful, integrated environment in which to build Android applications. LINQPad- LINQPad is also a great way to learn LINQ: it comes loaded with 500 examples from the book, C# 4.0 in a Nutshell. There's no better way to experience the coolness of LINQ and functional programming. Paint.NET- Paint.NET is free image and photo editing software for computers that run Windows. Notepad++- Notepad++ is a free (as in "free speech" and also as in "free beer") source code editor and Notepad replacement that supports several languages. Auslogics Disk Defrag- Compact and fast defragmenter with over 11,000,000 fans worldwide. It will improve your PC's performance by defragmenting and re-arranging files on your disk. Parallels Desktop for Mac- Parallels Desktop for Mac is the most tested, trusted and talked-about solution for running Windows applications on your Mac. VMware Player- VMware Player is the easiest way to run multiple operating systems at the same time on your PC. Although I have heard plenty of complaints about the iOS Developer Library I have only found certain information in the library. All iOS books, and I have read plenty, fall short on service communication and security. They either only mention it, or they use a third party library. I don't mind books including third party libraries, but I would prefer they include how to use the framework also. The Developer Library was the only source of any good information on service communication and security using the actual framework. I am not going to list all the videos I have found on the web. I am just including a few that were really beneficial. Is Your CMO Keeping Up?